It’s the behavior of the leaders that shapes the culture of an organization. Do you agree? As leaders, we make a conscious decision to lead well. But how successful are we if we don’t understand the impact of our own behavior on the culture of the organization. As leaders, we are always under the microscope of our employees; they mimic our behavior, adopt our values, and quote us. As for our customers, if what they see are inappropriate values that may determine whether or not to do business with. How can we ensure we are giving out the right message and that how we’re represented to our customers is good for the organization? Our behavior, and how it’s mirrored by others, impacts our organization’s bottom line. So it’s up to us whether our personal impact is positive or negative. Just this week I have seen examples of both positive and negative behavior which highlights the need for leadership to understand that setting a cultural standard can showcase the business well. It’s interesting that the two most emotionally charged environments for customers are flying and finances and yet much needs to be done to improve the cultures of these two industries regarding the behaviors they demonstrate when serving their customers. Having just completed a 14-hour flight and needing to change currency in a bank I feel able to make some comment on the service I personally received. Leg one of my flight had me more involved in watching the personal conversations/gossiping going on between the cabin crew when I was trying to get their attention for some water. To the crew, passengers seemed to be a distraction, at best, and a nuisance, at worst, to their conversation. It would not be difficult to determine that this level of poor customer service comes from the top. The second leg of my flight was entirely different, the passengers were king, and the staff was attentive. They were gracious and professional, able to accommodate different conversations amongst all age groups and cultures. Clearly, standards set by leadership. Next came the bank, long queues, no explanations, shortage of staff, and teller didn’t even look at me. Interestingly, I saw other tellers behaving in the same way. Again, this kind of behavior is mirrored from leadership. Sadly, I’ve experienced this the world over. However, the second bank welcomed me at the door, and based on my need, directed me to a teller. I was greeted with a smile and made to feel that my $500 money exchange was the largest financial transaction the bank would undertake that day. Clearly, an example of leadership that teaches appreciation for each and every customer interaction. When leaders set the vision and cultural direction through the lens of the customer, and they examine why people behave the way they do, they can then set vision and culture that responds to the needs of the customer. It isn’t enough to know that people are nervous about flying or that they are concerned about having enough money for their journey. Airline staff and Financial organizations need to understand not only how to build a trusting relationship with their customers, but also to examine themselves to understand how they will react to the anxious passenger or fearful investor. Great leaders know the importance of understanding their own leadership personality. By using a validated profiling system such as the DNA Behavior Natural Discovery Process, they can see in great depth their inherent behavior. This insight is foundational to self-awareness from which setting values and culture stem. Successful leaders set a vibrant culture that engages and energizes employees. They clearly define what culture means to them and walks it out both personally and professionally. A culture audit will quickly identify how set values are being interpreted. For example, lack of resources can trigger behavior that directly impacts culture. Lack of training is a further trigger. But if culture criteria and standards are not set and known throughout the business it cannot be audited. Michael Hiltzik, writing for the LA Times, makes this observation: The airline and banking industries may seem to be about as different as chalk and cheese, but Airlines and Wells Fargo have been shown to share a common bond: toxic corporate cultures that can be blamed on the men at the top, their chief executives. 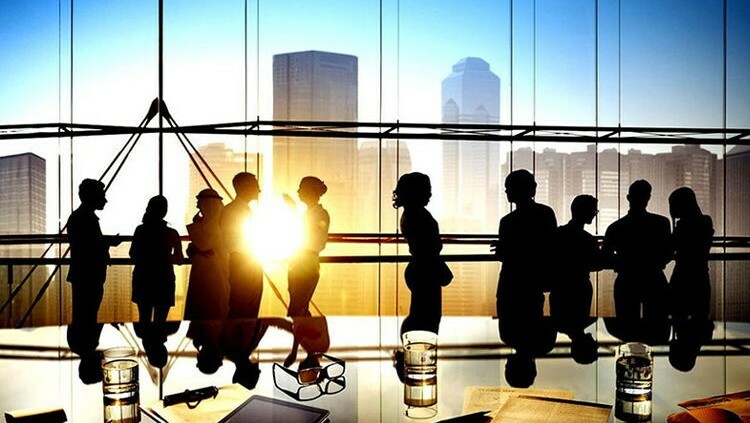 Investopedia suggests the following meaning of corporate culture: Corporate culture refers to the beliefs and behaviors that determine how a company’s employees and management interact and handle business transactions. Often, corporate culture is implied, not expressly defined, and develops organically over time from the cumulative traits of the people the company hires. Prof. James L. Heskett wrote in his book The Culture Cycle, effective culture can account for 20-30% of the differential in corporate performance when compared with culturally unremarkable competitors. Culture is learned behavior, but its growth comes from a place of self-knowledge. If leadership and individuals know their own personality, they can quickly identify how well they can adapt to cultural standards. So, what’s the lesson to be learned? Culture is set at the top of the organization. Leaders need to uncover their values as an important first step to establishing the culture of their organizations. This approach, using DNA Natural Discovery helps define the framework within which culture is set, decision making styles are formulated and goals achieved. It becomes especially important when leadership has different, even conflicting values. Admittedly defining your values is often hard to do, but when done truthfully and openly upfront at the leadership level, culture becomes much easier to set, communicate and carry out. Workplace attitudes influence every person in the organization, from team colleagues to the leadership. Attitudes can control the workplace environment by impacting morale, productivity, and team effectiveness. Understanding and recognizing the behaviors that are at the root of poor attitudes is essential to the ongoing success and security of the business. It only takes one person with an unchecked bad attitude to bring down an organization. The power of such an individual to cause destruction will stem from a variety of places: fear, anger, dissatisfaction, jealousy, or bad attitude. Whatever the trigger, the danger, if this behavior is left unchecked, can become a weapon of mass destruction to the business. What part do you play in ensuring inappropriate behavior is challenged? If you hear or are part of an exchange that begins with.. “just between you and me,” or “I know you won’t tell anyone..”, it’s clear a confidence is about to be broken. So, what is your reaction? Low-level gossipy stuff is every bit as important to identify and stamp out as is a wolf in sheep’s clothing. That one who presents as committed, loyal and trustworthy, but, under pressure, this surface learned behavior can turn lethal. A person who intentionally sets about leaking classified information (for example), and not always for monetary gain, but simply because they have been passed over for promotion, or they have some ideological position that they think legitimizes them to leak information. These are the people that CEOs are crying out to identify to limit the damage. A recent article in BuzzFeed News reports: Reality Leigh Winner, a 25-year-old Air Force veteran, was arrested on Saturday after the Department of Justice alleged that she printed out a classified document on her work computer and mailed it to The Intercept. Winner served in the Air Force for six years, where she worked as a linguist specializing in Arabic and Farsi. She had recently worked for a government contractor in Augusta, Georgia, where the NSA also has a facility. Only time will tell as to her motivations, but the question to ask is this – could managers and supervisors have read any signs to alert them to a rogue in their midst? The answer is yes. The 2016 Global Fraud Study by the Association of Certified Fraud Examiners (ACFE) estimated that the typical organization loses 5% of revenues in each year because of fraud. The total loss caused by the cases in their study exceeded $6.3 billion, with an average loss per case of $2.7 million. These statistics expose the need for robust and validated analytics to be the foundation for identifying/managing behaviors that can become a potential threat to business. DNA Behavior‘s founder and CEO Hugh Massie has always advocated the importance of putting people before numbers. He believes that investing in understanding people, and getting below the surface of what is seen, to discover inherent behavior will, in the end, safeguard the numbers, while protecting the business. Monitoring employees through the collection of Big Data can provide insights into social networking, relationships and even reveal normal behavior turning malevolent, but falls short. 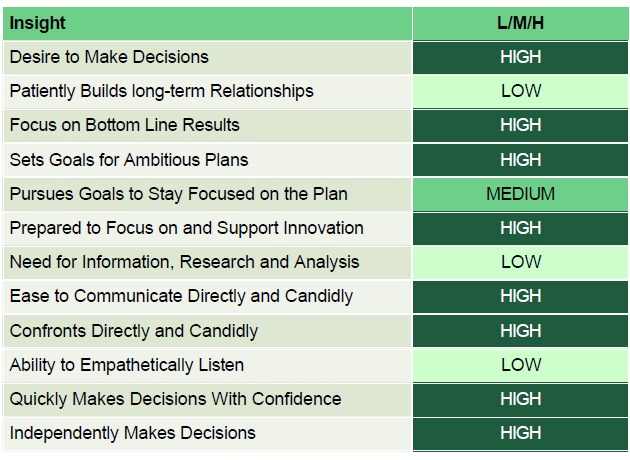 Readily available psychometric assessment tools bridge the gap. The Business DNA Natural Discovery Process identifies, who, when placed under pressure, is most likely to cause disruption to the business. Further, they reveal the environmental catalysts that provoke such behavior. In the current theater of world politics, opinions are heightened. 80% of future lone wolves are known to take politics personally and claim that they have been wronged enough that action would be justified. But creating rogue behavior does not necessarily require a change in government or some other significant change – the threat within can be a team member who cannot cope with pressure or are dissatisfied with the environment in which they work. It’s that simple. This kind of behavior can be revealed and managed. When every member of a team knows, understands and is comfortable with each others behavior, it not only builds trust, but such effective teams give companies a significant competitive advantage. High-functioning teams would identify and weed out malevolent behavior instantly. They are alert to any sign of inappropriate behavior and challenge it. Becoming a behaviorally smart organization is as simple as using a highly validated behavioral discovery process. Armed with the depth of insight such a discovery provides, management can dynamically match employees with specific environmental conditions to determine their potential response. They can also discern the degree to which such responses could create damaging behavior and negative actions towards the business. Lastly, management can apply these insights towards talent re-allocation, employee evaluation, team development and improved hiring processes. Gone are the days when talent alone gets you a job. While this approach served organizations well in the past, Hirers are now being tasked with vetting for values; for indicators of malevolent behavior under pressure; for approach to money; for bias; for candidates, whose behavior is consistent with the organization’s beliefs, values and culture. How businesses communicate and reinforce its culture directly, implicitly and through its reward system. What metrics are used to measure compliance with its cultural values? Implementation and consistent application of values throughout the organization. HR departments, hiring organizations and executive search consultants are now under pressure to introduce #extremevetting using validated methods such as the DNA Behavior Natural Discovery Process, to reveal a range of behavioral strengths and limitations. Employers need HR departments and recruiters to get below the surface of candidates to reveal the behaviors that cannot easily be revealed through questioning. Employers are demanding a holistic personality approach, not just a range of complex questions and resumes to be the tools for selection, nor scanning their social media for clues. While Big Data has a place, it cannot provide insight into the actual personality of individual prospective hires. People are unique; how they communicate, interact with each other, respond under pressure, manage their emotions, each of these will be different. Whatever the approach to building a picture of a candidate, a validated behavioral insights discovery procedure, such as the DNA Behavior Natural Discovery process provides 91% accuracy. The cost of a bad hire is not the only driver of employers, the growing concern is will this employee fit the values and culture, or bring down my business? Further, recruitment agencies and executive search organizations are concerned with protecting the integrity of their own business by requiring clients to fit the role in terms of both skills and personality. Many are now turning to the application of behavioral insights not just with candidates, but also through administering the DNA Behavior Discovery process with the client. Recruiters assess the manager and culture of the organization to ensure their selected candidates are not just suitable for posts, not just a good fit, but that they know in advance how to communicate with managers and understand the values and culture of the organization. Behaviorally smart organizations, whether recruiters or employers, define their values in cultural terms. And they now require interview processes to focus on whether the new hires will fit the desired culture without a steep learning curve to get up to speed. So, not just in terms of a candidate’s performance but their individual values and understanding of culture must align as well. This #extremevetting approach when partnered with DNA Behavior and their Behavioral Intelligence Solutions is a behaviorally smart first step in the hiring process. Do Your Board Members Play Well With Others? a. Identify their talents and determine where they fit in overseeing the organization b. Discover their personality and communication style; this will radically impact the way in which the board is chaired, how discussions take place and more importantly, identify any potential behaviors that, under pressure, could gravely impact the business of the board. 3. Appoint a highly creative, out of the box, thinker who may well be able to suggest solutions worthy of discussion that resolve a matter. 4. Conduct a specific talent discovery process and openly reveal the talent and experience in the room. a. This shows the extent of the board room think tank b. This delivers respect as board members defer to the colleague with the greatest experience in a particular area c.This takes trust from management to a whole new level when they see the board members respect each other for the skills they bring to the table. i. What are the issues most likely to raise tensions? ii. What are the bias and cultural challenges the group will face? iii. 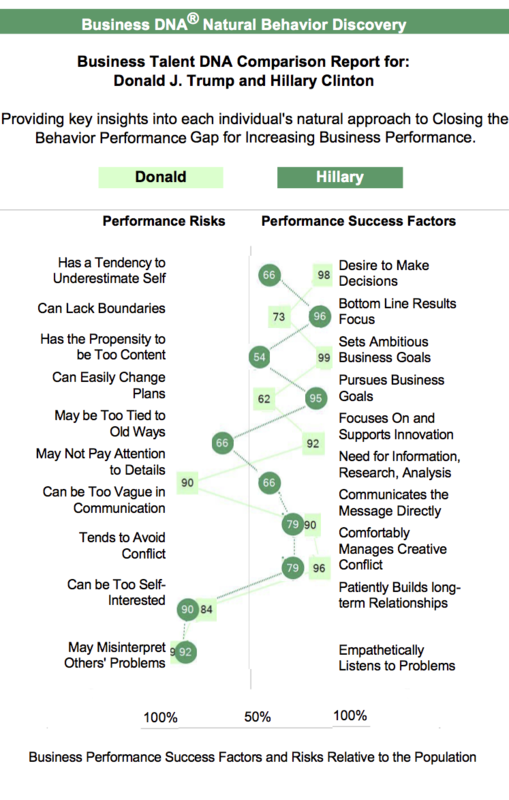 What personality gaps persist?between key players such as the Chair and the CEO? In conclusion: Jeffery A Sonnenfeld writing about good governance for the Harvard Business Review makes the following observation: For a board to truly fulfill its mission, it must monitor performance, advise the CEO, and provide connections with a broader world. ?It must become a robust team whose members know how to ferret out the truth, challenge one another, and even have a good fight now and then. https://hbr.org/what-makes-great-boards-great Only when you understand the personalities in the room can you determine whether the discussion is robust or chaotic. Nothing is more exasperating than watching a group of smart, qualified, intelligent executives deliberate about a key strategy, and fail to reach an agreement. In frustration, the team turns to the CEO to make the decision. 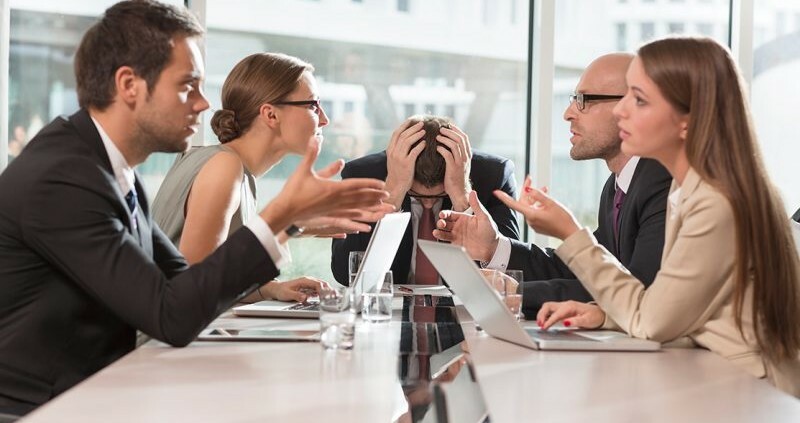 Yet this is counterproductive, as whatever the CEO decides, some of the team will resent – and that resentment leads to a lack of a commitment to delivering an outcome. It’s even more frustrating when attempting to reach a forward-thinking strategic plan for the business. How you might ask, can this be so? These people are our leaders. They set the direction of the organization. We rely on them to make sensible decisions that can impact our careers. So, how come they are in disarray? The CEO, after a few attempts to reach an agreement, called in a DNA Behavior facilitator to oversee the discussions. These are just a few questions that went through my head as I watched, incredulous, as a significant group of executives began the process of planning for the next stage of the company’s direction. As I sat to one side and observed their interaction, it was clear the room was heavy with bias, one-upmanship, egotism, and overconfidence pitched against compliance, indifference, and timidity. The assertive ones held their ground. The more vocal got louder. And the reflective and thoughtful seemed to be brooding. Nothing was being resolved. Every stake put in the ground took the team further away from making decisions. 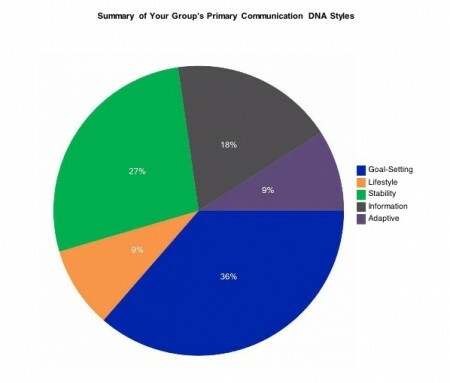 Each member of the team completed the Communication DNA Discovery Process, an assessment predominantly focused on revealing individual communication styles. Patterns quickly emerged showing the relationship gaps and areas where communication was breaking down, and why. Independent research shows that Communication DNA leads to solving 87% of business issues, which are hidden as they are communication-related. Once the team understood how their communication style was getting in the way of bringing their talent and behavioral smarts to the table, outcomes began to change. As the Goal Setting individuals encouraged input from the Information and Stability individuals and the Lifestyle individuals used their approach to encourage everyone of the importance to reach a solution – suddenly everyone felt they had a voice. And rather than chaos, a solid structure began to take shape. The team was then able to focus on their task. Egos, bias, and intolerance were replaced with listening, acknowledging input, and intelligent suggestions – a lively, but meaningful debate. As the task proceeded, the Lifestyle individuals suggested a flow chart to capture ideas. The Information individuals populated the flow chart, carefully catching ideas and suggestions. And the Goal Setters captured the key milestones for taking the organization into the next season and all agreed that it was a job well done. From my perspective, the lesson learned for them as a strategic planning team of executives was the importance of understanding how to communicate with each other. 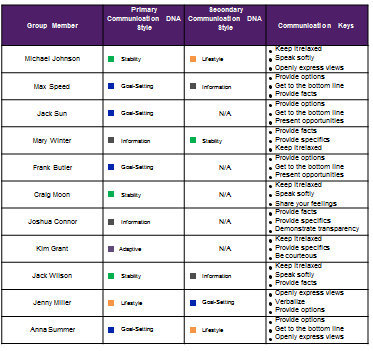 Without the Communication DNA Discovery Process, this team would have failed to meet its obligations to set out the strategic plan for the next season. Important skills and talents would not have been brought to the table. Individuals would have left frustrated, and the business would have suffered without a cohesive sense of direction.